Having drawn 500,000 audiences so far, the GazettE is now the hottest visual-kei rock band in Japan. 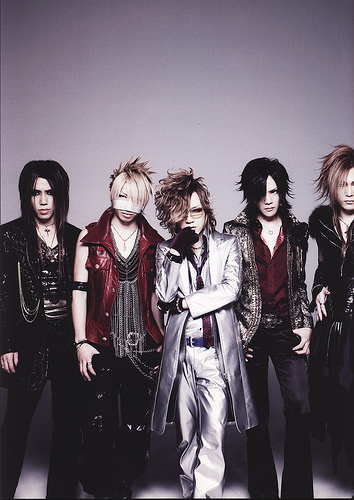 It consists of RUKI (vocal), URUHA (guitar), AOI (guitar), REITA (bass), and KAI (drums). The GazettE formed in 2002, but the band had hard time to sell records in early two years. After they released the first full-album “DISORDER” and succeeded solo concert, the band’s singles started ranked in the top 10 of Orikon chart (a major music chart in Japan). During 2006-2007, the band succeeded two Nippon Budokan concerts, and toured in Europe. Since the band became a frequenter to the top of Oricon chart, the GazettE’s influence has accelerated. The music video below is “Before I Decay,” a heavy metal/ hard rock song released a year ago. The GazettE is now on tour “TOUR 10 NAMELESS LIBERTY SIX BULLETS 01,” and the final concert “TOUR 10 NAMELESS LIBERTY SIX BLULLETS FINAL THE NAMELESS LIBERTY” will be held at Tokyo Dorm on December 26, 2010.